Located in Brooksville, Mississippi, Ole Country Bakery makes everything from pastries to pies, loaf bread to sweet bread, coffee, and a wide-selection of deli sandwiches, soups, and salads. Brookville is located just 9 miles north of Macon. 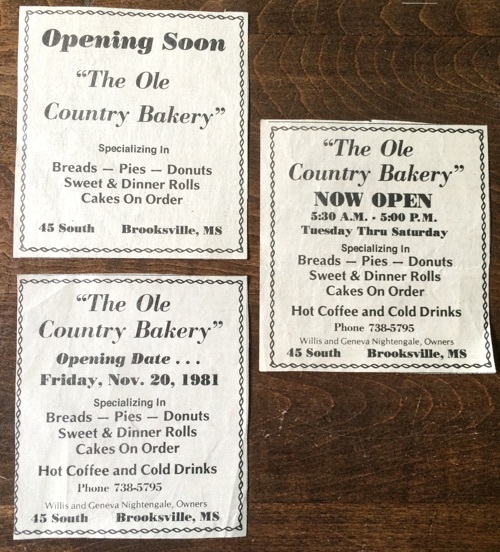 Ole Country Bakery is owned by Les and Sheila Decker who moved to Brooksville from Kansas in 2011 and bought the bakery which had been in operation since 1981. All our baked goods are homemade and preservative free! Except for items identified as “from the freezer,” everything is made fresh daily. The main baker arrives at 3:30 a.m. to start the day’s dough making. Other kitchen crews come in at 4 a.m. and at 5 a.m. and we’re open for business at 6 a.m.
Popular Ole Country Bakery selections are breakfast breads, pastries and muffins. Lunch deli favorites include our ham or turkey sandwiches dressed with lettuce, tomato and other fixings and served on our fresh baked homemade bread. Our dining area seats 40 people and provides a home-like environment. All-time customer favorites are our Amish Friendship sweet bread. Apple pies, pecan pies, and bread pudding are also favorites. In addition, we offer delicious baked cakes and welcome special orders. If you’re headed to a Mississippi State University game we’re just 26 miles from Starkville. Heading to Oxford for an Ole Miss game? We’re just 110 miles from your destination. Many of our customers stop in for a quick bite or to grab something for their tailgating parties. We also offer seasonal items and stay very busy during the Thanksgiving and Christmas seasons. Our pies, homemade rolls, heat and eat selections, and more are ideal for family celebrations, office parties, and gifts. An old filling station building, lots of determination, and many prayers mark the humble beginnings of the Ole Country Bakery. This small hometown bakery has become a popular treat and lunch stop for the locals and many travelers off highway 45. Located in Brooksville, Mississippi, this bakery is known for its variety of homemade pastries and breads. Les and Sheila Decker moved to Mississippi in 2011. They are striving to carry on the traditions of the Ole Country Bakery. The aroma of fresh baked bread and pastries is still bringing folks our way for miles around. Front Porch Coffee House, our little coffee shop, was added and includes locally-roasted gourmet coffee selections and coffee beans.